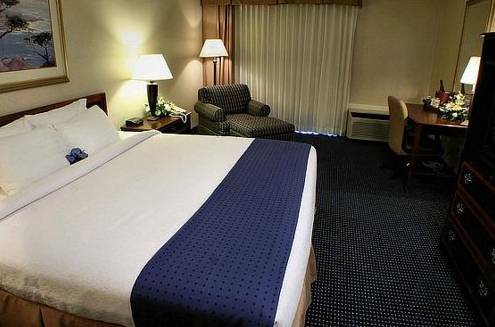 Downtown Akron, OH Minutes from Hotel Let the elegant lobby and friendly staff of the Holiday Inn Akron - West hotel welcome you to a comfortable stay in our contemporary accommodations featuring 42 inch flat screen television. If you are in town for business and need to get work done, we've got you covered. With the business center featuring copying, printing and a personal computer, as well as free high-speed Internet access throughout the hotel, you can easily complete presentations. We also provide meeting facilities that are perfect for your next seminar, banquet or special event. Our hotel's property in Akron is a leisure traveler's paradise, as it provides a location near great area activities, such as watching a game at InfoCision Stadium, visiting the National Inventors Hall of Fame and exploring Stan Hywet Hall and Gardens. After a morning of hiking, picnicking or winter-time sledding at Sand Run Metro Park, you can shop at the three shopping centers next door or at Summit Mall, just 1.6 miles away. Other hotels in Akron can't compete with our outstanding amenities, including our fitness center, outdoor pool and the two restaurants located inside the hotel. Surrounded by several excellent restaurants, shopping plazas, theaters and golf courses, the Holiday Inn Akron, OH hotel has everything you need to feel right at home. Montrose Bar and Grill: Enjoy a casual meal in a pub setting found right here in the hotel across from the front desk. Montrose Bar and Grille: While our hotel's near downtown Akron, Ohio, you can enjoy a drink just steps from your room or suite. Montrose Bar and Grille is the perfect place to relax with a cocktail or cold brew and the perfect appetizer after a day of meetings or sightseeing. Akron ZooThe Akron Zoo, an accredited World Conservation Zoo, houses more than 700 animals, including the endangered Humboldt penguins, snow leopards, Sumatran tigers, jaguars and Komodo dragons. Akron Art MuseamThe Akron Art Museum is an art museum in Akron, Ohio, United States. The museum first opened its doors on February 1, 1922, as the Akron Art Institute. It was located in two borrowed rooms in the basement of the public library.